‘…let men first do some great thing that shall be told among men hereafter’. These stirring words from the Iliad were spoken aloud last week, to an audience in the most unusual of places: the Great Court of the British Museum. The performance of the entirety of Homer’s poem about the Trojan War began under a glass roof in a space better known for its cafes and totem poles, and was epic: it took 15 hours and more than 60 actors – Simon Russell Beale, John Simm, Ben Whishaw and Brian Cox among them – to complete it, which they did, finally, at the Almeida Theatre in the early hours of Saturday morning. The Iliad Live is one performance in many in the growth of ‘event art’. Museums, galleries and concert halls are all trying to liven things up, to be more than just institutions that show objects, art and music. They want to be cooler – happening – so they make an event out of the culture on display. It’s easy to understand why. Cultural organisations can have a dusty whiff about them, an old-fashioned silence that is creepy for some and off-putting, especially, apparently, for the young. It’s no longer enough to just put on a play, or an exhibition – hence the late openings, date nights and musical offerings at many. And that’s fine and dandy. Most of the time. Event art took off with the National Theatre, when it started to live stream its productions in cinemas. It was a way to make theatre more accessible that actually worked – not only did thousands more get to see the play, but watching one at the cinema, as it is performed, surprisingly feels like a real event. You don’t feel if you are relegated to an overspill room at some boring conference; it’s an occasion in its own right. The film format doesn’t detract from the show, in fact it adds to it. You get closer to the action, and can better witness every facial expression. But it’s increasing difficult to escape event art. 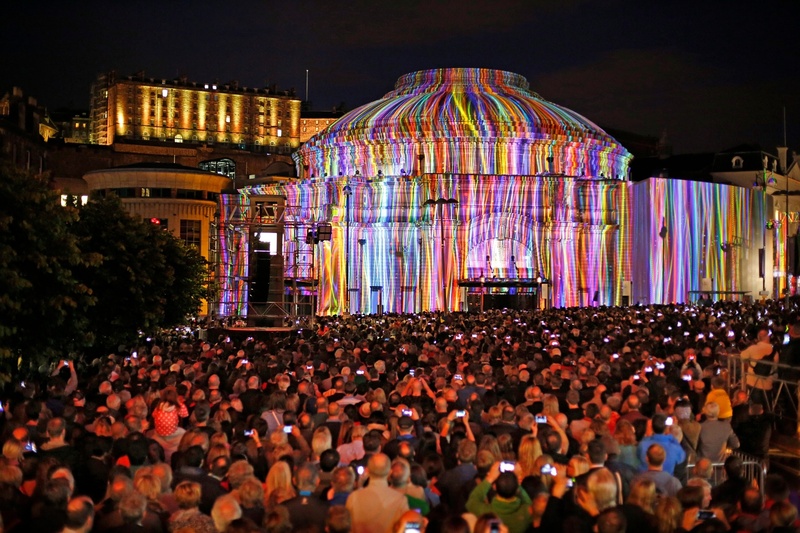 Cinemas now show live close-ups of art exhibitions, too, and recently the Edinburgh International Festival opened with a free concert – the Harmonium Project – which combined John Adams’s choral work Harmonium with a series of animations projected onto the outside of the Usher Hall. It turned the usual kind of concert inside out – performances normally take place inside the hall. But the success of Harmonium project was an illusion. There wasn’t much to it: nice music, nice lights on a building. Fine, but forgettable. It won’t be spoken of in thousands of years’ time. You have to ask, what was really happening? What was actually on show? And the answer is, we were – the crowd. What mattered was that there were a lot of people hanging around. That’s about it. And that’s also the problem with the Iliad Live: it was mostly about the staging of it – the do. A great deal of event art is more about the event and the audience than it is about the art. The throng – the sight of people congregating – is being used to prove relevance, to demonstrate that cultural institutions are hip and popular. But in chasing the buzz and pursuing the people, the art – a poem, exhibition, orchestral work or a play – can get lost. The danger is once the novelty wears off there is little to show for it. The crowds will vacate. If we want men in the hereafter to talk about the art work, cultural institutions will have to do more than stage a happening, they will have to do more than attract a crowd. They first have to do some great thing.